As with any paint spill, you'll have an easier time removing one from tile if you get the paint while it's wet. Whether the paint is wet or dry, though, you may have trouble getting it out of the grout. If scrubbing with a solvent doesn't do it, you can always remove the paint-stained grout and regrout. It's possible to remove even a large spill from any type of tile by dabbing with an absorbent rag or a handful of paper towels, if you can get to it before the paint starts to harden. Once the bulk of the paint is gone, wash with a generous amount of the appropriate solvent. For latex paint, that would be plain or soapy water; for oil-based paint, use mineral spirits. Scrub the grout with a synthetic fiber scrubber. Avoid steel wool, which can leave scratches on ceramic, porcelain and metal tiles. If your spill has dried, you may be able to remove much of it by scraping with a plastic putty knife; again, it's best to avoid metal, but if a plastic knife doesn't do the job, use a beveled putty knife with rounded corners. You'll probably get most of the paint off with one of these implements, but if any residue remains, wash it with warm soapy water or mineral spirits, depending on the paint. You or someone else may have painted your tiles in the past, and now the paint is peeling or you simply want to restore the tiles to their original condition. Use paint stripper to get off the bulk of the paint; choose a soy- or citrus-based product to be kind to your lungs and skin, and spread it generously. Let it work until the paint begins to bubble, then scrape it off with a plastic paint scraper or putty knife. You may have to repeat this treatment more than once. Finish up by scrubbing with soapy water or mineral spirits. Because grout is porous -- especially if it isn't sealed -- paint can soak in and cause discoloration that's hard to remove. Scrub discolored grout with an old toothbrush, using rubbing alcohol to dissolve latex paint residue and lacquer thinner for oil paint. In the end, you may not get all the discoloration out, and your only option may be to remove the affected grout with a rotary tool and grout-removal accessory. 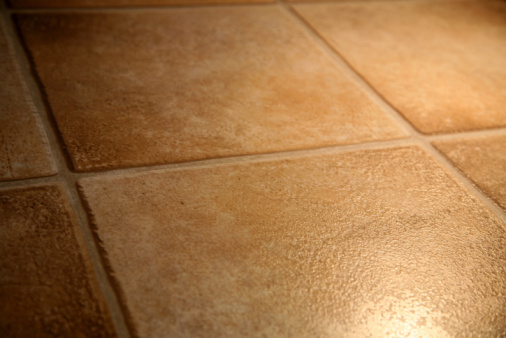 When you apply new grout, be sure to seal it to prevent similar stains in the future. Can I Use Turpentine on Shower Tiles?